It is so great to be back after a few weeks off! I hope that you had a wonderful time with your friends and family and got to enjoy a well deserved break. Now it is an exciting time to look forward to a new year with excitement and I am sure plenty of challenges. Here is our challenge this week over at the Global Design Project Challenge blog. I am getting ahead and thought I would preplan - we always need cards ready to go for our special friends and celebrations and the Number of Years stamp set is one of those ones that you might look over. These gorgeous flowers were perfect for this colour challenge - I used my Stampin Markers and kept the card clean and simple. I adore the white on white layers. Things are still very busy in the Sharp household - packing and moving, which is exciting but lots of work! I am exhausted. It will be wonderful when it is all accomplished though right? Thanks so much for coming by today. 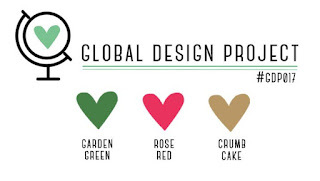 Please make sure you go and see our other designers work over at the Global Design Project for this colour challenge. Ps I know you know - but I love hearing from you! I adore the simplicity of this card - yet it's still overwhelmingly beautiful. 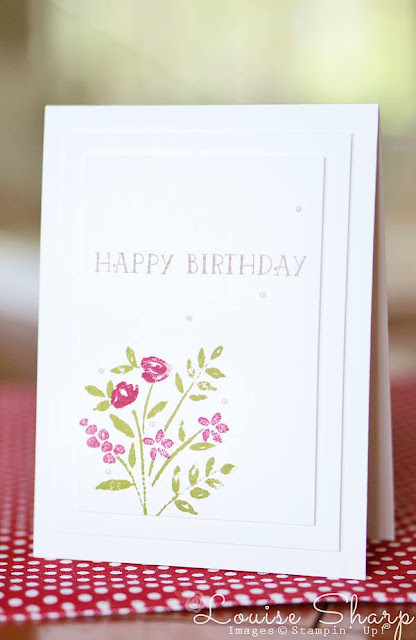 The white layers are perfect to create a delicate frame for this card. Love it! So simple and soo beautiful! your Card is very beautiful. I like clean and simple cards. My favorite this time are white Cards. The white on white works so well and make the coloured image just pop off the card, stunning! Beautiful card Louise! Wonderfully CAS and I love that you layered the white panels.